Nigeria coach Stephen Keshi has stepped down from his position after the Super Eagles' exit from the World Cup in Brazil. France scored twice in the last 11 minutes in Brasilia on Monday to reach the quarter-finals at their expense. The 52-year-old was appointed Nigeria boss in 2011 and helped them become African champions two years later. Nigeria captain Joseph Yobo also retired from international football following their exit. Fenerbahce's Yobo, 33, scored a late own goal after Paul Pogba's header had broken Nigerian resistance. Keshi offered his resignation after last year's Africa Cup Of Nations triumph, citing a lack of support and respect, although he was persuaded to stay by Nigeria's sport minister. A group stage win against Bosnia-Hercegovina helped Nigeria reach the knockout stages of the World Cup for the first time since 1998, despite the players being involved in a row over bonuses. 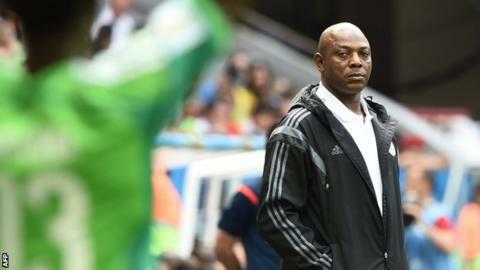 The achievement also made Keshi the first African coach to lead the Super Eagles past the group stage. However, he now becomes the sixth manager to leave his job during the World Cup, following the departures of Honduras's Luis Suarez, Iran's Carlos Queiroz, Japan's Alberto Zaccheroni, Italy's Cesare Prandelli and Ivory Coast's Sabri Lamouchi. Keshi, who captained Nigeria at the 1994 World Cup finals, was previously in charge of Mali and Togo. Yobo told BBC Sport it was a sad but glorious end to his own international career as Nigeria failed to make their first ever quarter-finals. "This is it. I can look back on my career with great pride," he said. Yobo is his country's most capped player with 100 appearances and will continue to play club football. His 10 matches at World Cup finals - a national record - have come in three tournaments, 2002, 2010 and 2014. "I wanted to leave on a high for my country. Defeat by France was not the right way to go but I'm happy with all I've done for the national team," he added.